The Liga MX season has been halted after officials decided to go on strike over concerns for their own safety. 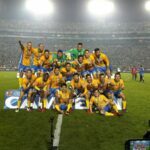 The decision stems from two recent incidents in which players acted aggressively toward referees during Copa MX matches, which the Mexican Referees Association condemned through their official Twitter account while expressing support for the mistreated officials. In one incident, Club America’s Pablo Aguilar headbutted a referee just after full time of a 1–0 loss to Tijuana. In the other, Toluca’s Enrique Triverio shoved a referee who had just sent off two of his teammates, earning a red card of his own to put Toluca down to eight men before they ended up losing 3–0 to Morelia in a shootout (one of the players sent off was Toluca’s goalkeeper). Liga MX suspended Aguilar 10 matches and Triverio eight, but this wasn’t enough to satisfy the match officials’ association. It’s unclear how long the officials will remain on strike, but a strong statement is being made with this act. They’re making it clear that they will not be bullied by players or taken for granted by the league. And if they’re still mistreated once they agree to return to the job, they should probably be allowed to carry pepper spray. That will definitely convince players to keep a safe distance. UPDATE: Aguilar and Triverio’s suspensions have been dramatically extended to one full year each, presumably in an effort to get the referees back to work. This should do the trick.